Gaze Burvill's new A la Carte Grill Station is a standalone BBQ unit, housed in a craftsman-made, prime-grade oak surround, lined in resistant Medite Tricoya, with prices starting at £17,640. A Sub-Zero Wolf BBQ Grill, and worktop in either leather-finish granite, or high-performance Sirius by Dekton Cosentino. The A la Carte collection is made from solid oak, and all appliances are specified for outdoor use. First sight of the new Grill Station was at RHS Chelsea Flower Show, in a ‘New England’ finish, a blend of natural oils which gives the furniture an elegant ’silvery grey’ appearance, similar to the silver of naturally weathered oak pieces. The product reflected the improved economy and willingness of consumers to buy high-end items, said the company. A la Carte outdoor kitchen collection A la Carte Grill Station dimensions: 177cm wide - 86cm deep - 92cm high (+Grill hood). All feet are individually adjustable. The Grill Station is priced from £17,640. The Grill Station is the "perfect first step towards building a full A la Carte kitchen, with fridges, warming drawers, gas burners, sink unit, and more to be added later if wished". The cupboards provide storage, of course, and can also house gas cylinders, however, the Sub-Zero Wolf BBQ Grill can be plumbed in to a residential gas supply. Last year, the world’s largest and most expensive barbecue – the £13,500 Kalamazoo Hybrid Fire Grill – from Michigan, was revealed. Owner Simon Burvill said: "the best kit puts the fun into life. We have got used to really high quality appliances and accessories for our kitchens inside the house, so that we now can’t stand it when a poor BBQ messes everything up. 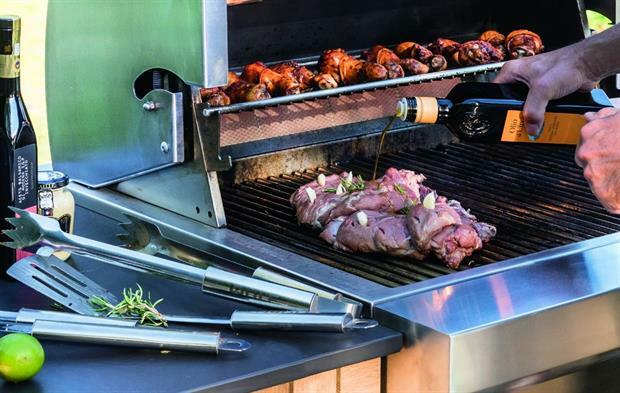 We just want to enjoy cooking al fresco, and the Gaze Burvill Grill Station looks amazing, is easy to use, and takes the professional cooking experience outdoors."